Islands have a special attraction for many people, especially small off-shore islands, clearly visible from the mainland, yet tantalisingly out of reach. They have a certain mystical quality drawing us back to the past and a more simple way of life. The coastline of Donegal is dotted with many such islands, most of which are now uninhabited. It was on an August day in 1976 that I stood with my wife and three small children at the end of Cruit Island and gazed across the narrow strait to the recently deserted Owey Island, once home to thirty families. We made a promise to ourselves that day that we would come back the following year and buy a little cottage on Owey Island…….and that is exactly what we did ! You can still see its white outline second from the left as you look across from the golf clubhouse. What an odyssey began that day, culminating five years later in the construction of Donegal Thatched Cottages !! We spent many happy summers on Owey Island……….no electricity, no running water, often the only ones on the island for weeks at a time. What a learning curve and what an experience for both ourselves and our children !! Here below we offer details of four local island trips you might like to consider while staying at those very Donegal Thatched Cottages. Owey Island lies midway between Gola and Arranmore and is just off-shore from Cruit Island, visableto the north west from the cottages. The recently whitewashed cottages on Owey are clearly visible from the Clubhouse at the end of Cruit. It is roughly the same size as Gola, being a little over 300 acres in area. Like Gola it was once home to almost a hundred islanders but this population had reduced to about thirty by the time the last islanders left in 1974. After having lain deserted for 25 years Owey is now enjoying a whole new lease of life. Many of the cottages have been renovated and the island is a beehive of activity during the summer months. To facilitate this, the first tractor ever was brought over to Owey by raft in the summer of 2005. What excitement !! Indeed the harbour or “spink” as it is known locally is often crowded with the boats of both day-trippers and those who now spend considerable time on Owey in the summer. Unlike Gola there is no mains water or electricity on Owey. The islanders have to depend on gas light and spring wells. In a dry summer such as 2005 many of the wells ran dry. Despite the many hardships there is something special and exciting about spending time on an off-shore island. Dan ( Betty ) Gallagher, who was born and reared on Owey, now operates a low cost ferry service to the island. The crossing only takes 5 minutes. Arannmore Island is the largest off-shore Island off the Irish coast. It is clearly visible to the west from the cottages. It has a permanent population of about 500 persons and is accessed from the fishing port of Burtonport about five miles from Donegal Thatched Cottages. Half of the island is Irish speaking and the other half is English speaking. The ferry service runs quite regularly, about every hour in the high season and every two hours otherwise. Full details at www.arranmorefastferry.com. The passage, with Rutland Island on the left and Iachtar Island on the right is normally very sheltered and takes about twenty minutes. The ferry can accommodate cars but we recommend either bicycles or indeed simply walking around the island so as to enjoy its relaxed atmosphere. After a relaxing day, you can drop into the local island pub for a refreshing pint of Guinness, before making your way back to your thatched cottage. Tory Island is Ireland’s most remote off-shore Island, being about 9 miles off-shore, and is often cut off from the mainland during winter storms, when it is accessible only by helicopter. This has the advantage, however, that it remains the last bastion of real island culture, being relatively free of 21st century influences. It is home to about 150 hardy residents, who up to this point have resisted the lure of a much easier lifestyle on the mainland. It is an Irish speaking island with its own elected King and a growing reputation for its raw, natural, artistic talents. It is serviced by a regular ferry service from either Bunbeg Harbour, Bloody foreland or Downings……depending on the tides. The journey takes about 45 minutes and can be quite rough, depending on the weather. However we still recommend you consider it. It is best to check in advance regarding ferry times and location. Contact Donegal Coastal Cruises Ltd. at 074 9535061 or 074 31991 or www.toryislandferry.com. Gola Island is about 400 acres in size and was once home to over a hundred people. It is clearly visible to the north east from the cottages. 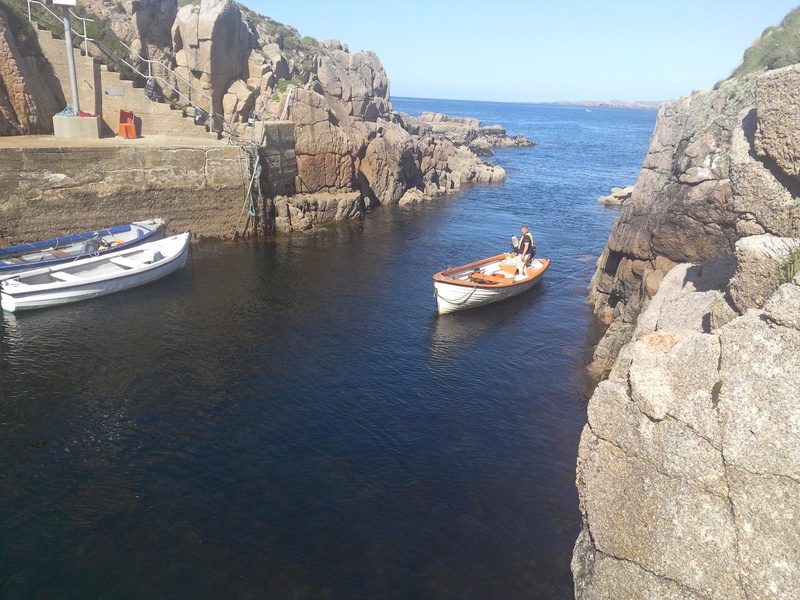 The islanders left Gola in the 1960’s and today nobody lives on Gola full-time, although an increasing number of former islanders and tourists are busy refurbishing various cottages on Gola with a view to spending some time there during the summer months. There is a fine beach on the island and a safe pier for landing. It was immortalised in the sad lament “Baidin Fheilmidh”, a song about a group of islanders who were drowned when their boat went down as they were returning to Gola after a wedding on the mainland. Gola is about 1 mile off-shore from Magheragellan Pier but is accessed from further away at Bunbeg Harbour, where the Baidin Fheilmidh operates island trips during the summer.